Here is a collection of baking and cooking recipes using sweet potato as one of the ingredients. This page will be updated on regular basis. Do you have lot of sweet potatoes at home? Wondering what to do with it? 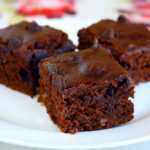 Why not try this easy sweet potato brownie recipe without eggs and sneak in some veggies into your kid's favorite treat. Beets, pumpkin puree are also good substitutes for the sweet potato. Having leftover cooked sweet potato? 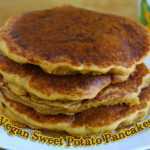 Make these fluffy, whole wheat, vegan sweet potato pancakes that everyone will devour. Pumpkin puree is also a very good substitute for the sweet potato. So this will be a perfect pancake recipe during the busy Thanksgiving week or any Tuesdays!